Black Hole gear has 3 variants: MK-1, MK-2, MK-3. MK-1 is vendor brought via Black Hole Commendations (except for weapons). MK-2, and MK-3 are direct drops from Hardmode Explosive Conflict. For the Black Hole Commendations, the current drop rates are 2 per boss and 4 per chest found in storymode Explosive Conflict. Hardmode Explosive Conflict drops 4 per boss and 4 per chest. Nightmare KP bosses also drop 2 Black Hole Commendations per boss (not verified yet). Corellia Black hole weekly will reward you with 6 Black Hole commendations per week. If you are clearing both storymode EC and Nightmare KP weekly, you can expect at least 2x 4 + 2×5 = 18 Black Hole Commendations weekly just from the bosses. Doing Corellia weekly will grant you an additional 6 more, totaling 24 Black Hole Commendations. With the drop from chests (2 chests found so far in EC, players have reported 3 chest in total), you can expect 30-40+ Black Hole Commendations per week as a rough estimate. If you are clearing Hardmode EC as well, you can expect at least 20-30 more Black Hole comms, totaling 50-60 Black Hole Comms per week. The prices for the Black Hole gear are listed below. Keep in mind that the vendor does not sell any weapons (mainhand for most classes, mainhand + offhand for dual wielding classes) or relics. For Campaign gear, it is simply 1:1 exchange of the tokens you loot from bosses like you do currently for Rakata gear. The Campaign vendor does not sell any ear/implants. Campaign relics can be brought for 200 Daily Commendations from the Mission Support Vendor on Ilum/Corellia/Belsavis. 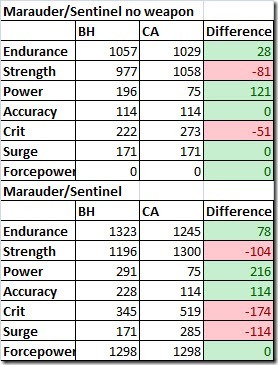 I originally wanted to do an old Rakata vs newly itemized Rakata and “new” Rakata vs Campaign gear comparison to give you a feel of how much stats change when you upgrade to the next tier. Unfortunately, with the recent itemization changes back and forth on the PTS for both Rakata and Battlemaster, I will wait abit before doing so and update this page when I do. Black Hole has 3 variants: MK-1, MK-2, and MK-3. MK-1 is vendor brought and is being compared below. 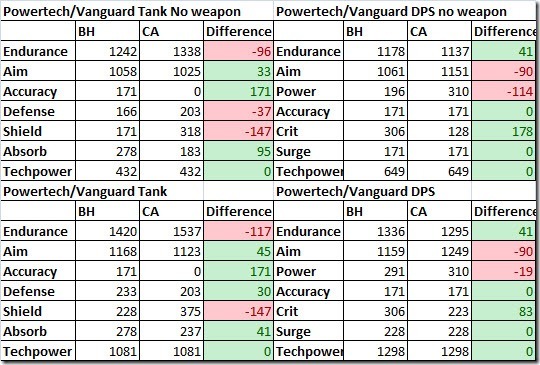 MK-2 and MK-3 drops from Hardmode EC and will be compared in a later date. Campaign ear/implants do not seem to exist and you may need to purchase Black Hole MK-1 ear/implants instead or get MK-2/MK-3 as drops. Campaign relics can be bought for 200 Daily Commendations, no equivalent Black Hole version seem to exist. Black Hole MK-1 weapons (i.e. mainhands for most classes, mainhands & offhand for dual wielding classes) are not available from the vendor but they exist in the database. Campaign weapons are available from the vendor. For comparison purposes, ear/implants/relics were not included. 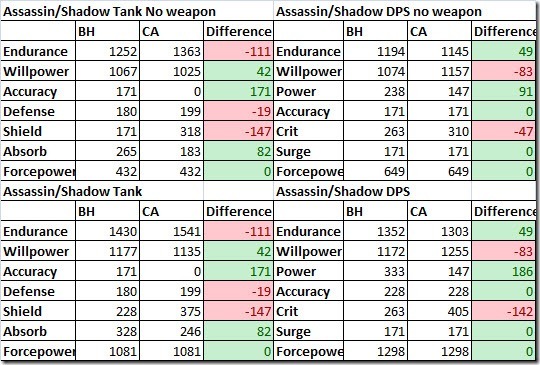 Two comparison charts shown: one with weapons, one without weapons. Based on the current tooltips, the BH gear does not have a set bonus applied, but the Campaign does. Is this confirmed to be the way the sets will work? Does anyone else see that the cybertechs are going to have to farm the BH comms to be able to buy all the equipment to RE the Armorings and Mods for these since we can’t RE armoring with a set bonus? Corrected an issue that could prevent stats and set bonuses from appearing on items purchased from Campaign and Black Hole vendors. I think the Black Hole sets are not supposed to have set bonuses anyway. The patch notes mentioned the “items purchased from Campaign and Black Hole vendors.”, but there’s another line that says “The Crisis Point vendors are now labeled as “Campaign and Black Hole” vendors.” Since both sets are purchased from the same vendors, I believe they were just referring to the Campaign set bonuses. So am I correct in seeing that story mode gear is the same item level as hardmode? Does the Black Hole Gear have set bonuses? Blackhole will not have set bonuses. The Patch notes said BH gear would have set bonuses, not sure if the items have it on the PTR yet. To Dulfy, you made typo with the Sorcerer gear, you called Force-Master a heal set and liste Force-Master under the heal section. Am I seeing this right that the campaign set includes augment slots? That would be an amazing thing… and would not counter the crafters at all. Sorry, augment slots are not included. The tooltips mistakenly shown them for the Campaign gear. You should be able to reverse eng these armor for the orange schematic which can be crafted with augment slots but they don’t come with augment slots by default. Don’t know whether I should replace my rakatta ear with an augmented Columi I made, or just wait and buy the BH. I kinda like the fact that both sets are equal ilvl but mixing and matching mods from both sets will be optimum. Eg. 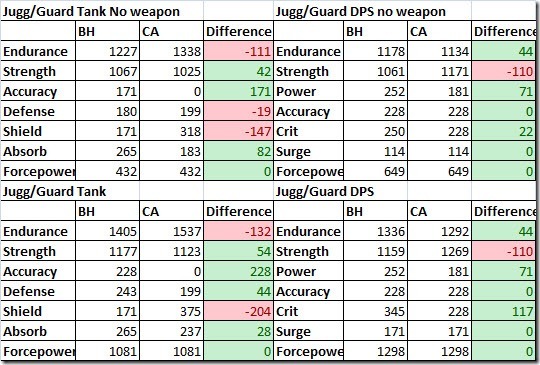 for JK tank the BH set has a tonne of Acc where the CA has zero. 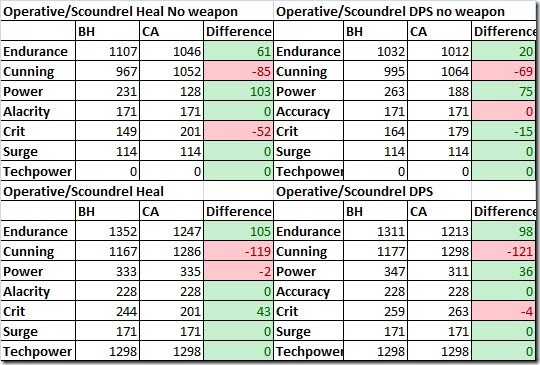 So from the looks of this, it appears the only difference between Story mode and Hard mode EV will be that Hardmode directly drops 146 gear (though tokens) as opposed to needing to farm commendations from Story mode? Also, from what you have above, it appears Black Hole commendations do not drop in Hard mode EC? 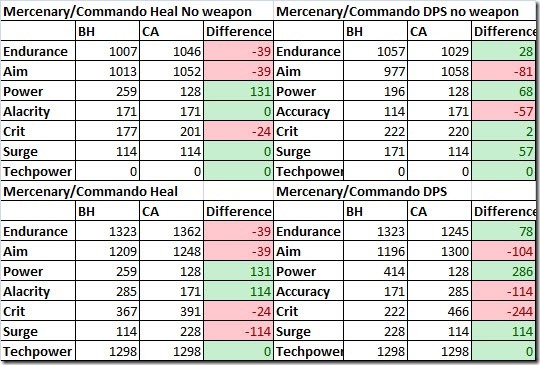 **EDIT** Saw someone on the forums say Hard mode EC drops Campaign gear and each boss drops 4 black hole commendations. Can you confirm? 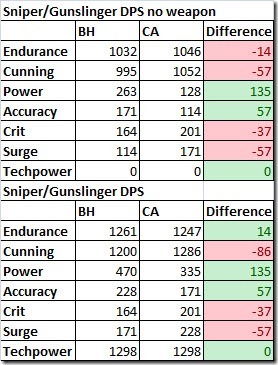 This is somewhat disappointing as people will probably want to mix Campaign and Black Hole gear mods for the best stat stack. I would hate to see people who can clear hard mode forced to run Story mode just to get the commendations for Black Hole gear. http://www.swtor.com/community/showthread.php?t=390271 about Hardmode dropping 4 Black Hole Comms per raid. He is probably right but we havn’t cleared any Hardmode bosses in Explosive Conflict so I can’t confirm that. What I have posted so far are my first hand findings. It is still not known if Black Hole stuff won’t have set bonus or the just forgot to put it in. 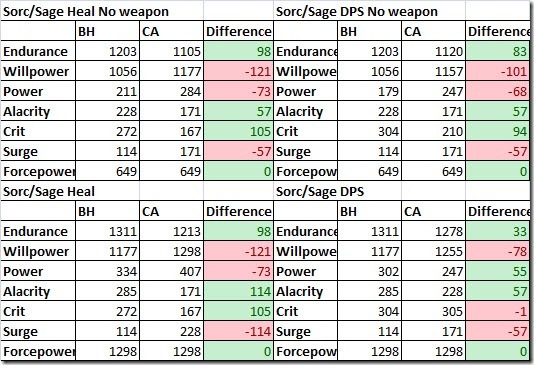 What is the point of raiding Hardmode if the gear is the same as normal? That is really good question and I have being wondering that. I am guessing it is because you can gear up faster in hardmode as it seems you only get enough Black Hole Comms per week to buy 1-2 piece of gear. Cant you do both HM and normal each week? Looking at the gear, it seems that the color crystal’s for the new weapons are orange? Is this just used as a filler? Because it seems like a downgrade from Black/Red nor does it seem like a very “Republic-like” color. Maybe I missed it…but what does the FP Weekly quest give reward-wise? I believe in Patch Notes it said the new weekly was going to be Kaon and Lost Island…is it for NM or HM? There is a new weekly specifically tailored toward the Rakghoul FP’s and there’s the other weekly HM FP quest that rewards the same amount of columi and tionese tokens as it did before. I can confirm for a fact that completing the new Rakghoul weekly rewards 8 Black Hole Commendations. Completing Story Mode EC last week, getting all the chests except the last one cause it bugged on us and downing all the bosses, plus doing the Corellia weekly and finishing the Rakghoul specific HM FP quest rewarded me with 38 BH Commendations. It would obviously be higher if that chest hadn’t bugged on us but you can easily get the cheapest stuff, like Implants and Earpieces, in just one week if you are able to complete everything above, except HM EC. Hey Dulfy, great site! Sorry if I missed this in an update, but have they added more than the Relics for new high end stuff you’re able to get with daily commendations, or are there no new equivalents to the Rakata gear you can currently buy from the mission support vendor in the latest build you’ve seen? Thanks a lot for this post. A lot of interesting informations. Are you sure there is not another one. Because this one got strenght and no willpower at all. where do i get for 50 black hole marks the “Black Hole Mender’s MK-1 Vibroknife” ? the vendor has nothing…. Hey Dulfy! Your site is my favorite for information like this. Keep up the good work! What server do you play on if you don’t mind me asking? So where do the Black Hole weapons drop? Askmrobot seems to think the mk-1 is commendation bought… except the vendor doesn’t have them!